Tired of the same-old camping routine? 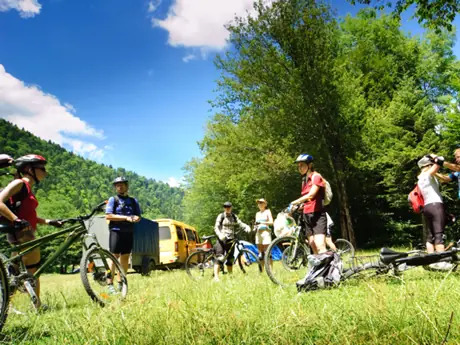 Make your next camping experience more adventurous–and memorable–by reenacting the past, testing your survival skills or adding a bicycle to the mix. Try one–or all five–of these extreme trips to remind yourself why you love the outdoors. Step back in time and experience outdoor living in a historical context. In the U.S., the Civil War is the most popular type of historical reenactment, with other genres including the Roman Legion, WWII, the Revolutionary War, and Medieval Times, to name a few. Participants, usually members of formal organizations, provide their own authentic kits and uniforms that often include weapons and tools of the period. Some reenactments last a day while others take place over a weekend or longer, featuring maneuvers, marches and historic battles. For these events, enthusiasts live in camps typical of the period and use accurate replicas of utensils, shelters, furnishings, lighting and food specialties. Because authenticity is key, historical reenactment groups seldom offer casual "civilian" participant experiences. Consider working with a local organization to give this form of camping a try. For your first trip, stay close to home in case problems arise. Travel farther away as you become more experienced. Trip expenses are quite low once you've purchased the bike and equipment. Food is often the most expensive aspect. You can go bicycle camping on most bikes. Minimalist campers ask: why lug along substitutes for just about every household convenience you own when the idea of camping is to get away from all that? A tent big enough to sleep in and a ground sheet or tarp. If you do bring a groundsheet, pack a tarp as well, in case of an emergency. Minimum amount of clothing. This means you'll wear everything more than once and bring enough to layer in case of cold weather. Basic cooking gear: a small camp stove, one pot or pan, tongs, a single set of utensils, a cup or water bottle, tin foil, matches and a basic ax. Don't forget about food, but leave the gourmet goodies at home. Stick with easy-to-make meals that can be taken on the go. Jeff Adams is a California-based freelance writer, contributor to ReserveAmerica.com and an avid camping enthusiast. He's been dragging his trailer and willing family around the western U.S. for more than a decade.